The MMC With Smark Henry (11/6/18): Wait, There's a Playoff? - Smark Henry | The voice of Filipino wrestling fans | Philippine Wrestling Revolution, WWE, and more The MMC With Smark Henry (11/6/18): Wait, There's a Playoff? The MMC With Smark Henry (11/6/18): Wait, There's a Playoff? The WWE Mixed Match Challenge second season group stage is now down to two playdates and one thing that is not clear up to this point is the tournament format. Back when the tourney started, all they mentioned is that teams would face each other in a round robin format with the best RAW squad going up against the best SmackDown pair. What they didn't spell out in the beginning is whether there will be interbrand matches in the elimination round, and if there would be a playoff knockout round. As revealed in the postmatch interview with the defeated B'n'B, they qualified for the playoffs after finishing with a 2-2 win-loss record. I guess it follows that this episode's winners Day One Glow made it to the next round as well. This newfound information makes the next two sets of bouts inconsequential, or at the very least, a battle for seeding. For one, I have no idea how the playoffs would play out. How many teams advance? Are the playoffs crossover, ladder, best seed against worst seed? Can they at least tell us what's going to happen next? Are we, as consumers of the product, asking too much from the tournament organizers to actually have their competition organized properly? How is the MMC different from an inter-barangay summer basketball league where rules are more like recommendations that can be changed at any time, rather than being set in stone? Even the whole men-fight-the-men-women-fight-the-women rule is lax enough to the point where one can interfere with the pin attempt of the other and not get disqualified. Call me pedantic, but how can I follow the narrative when there is no clear-cut narrative to begin with? At least with actual athletic competitions, the playoffs and knockout rounds are spelled out at the start. We all know from the beginning that the NBA postseason would have the eight best teams from each conference go up against each other in a best-of-seven series until one emerges and is declared champion. To quote a certain famous Manchester band's song, "D'you know what I mean?" When the announcers say to swipe it to the right, how come they swipe to the left when they are demonstrating it? To all those aren't familiar, the song the crowd was chanting to Bayley is DJ Ötzi's "Hey Baby (Uhh, Ahh)". Lack of disrespect is respect, Renee Young. Good catch, Facebook Live commenter. Cue "Yakety Sax" during that Lio Rush-Finn Bálor wild goose chase around the ring. As noted by ardent observers, this has been the first time in a long while Mickie James won with her finisher. Dating back from their recent duels on Raw, Bobby Lashley continues to have Bálor's number. Jimmy Uso: the hijacker of postmatch interviews done at gorilla. 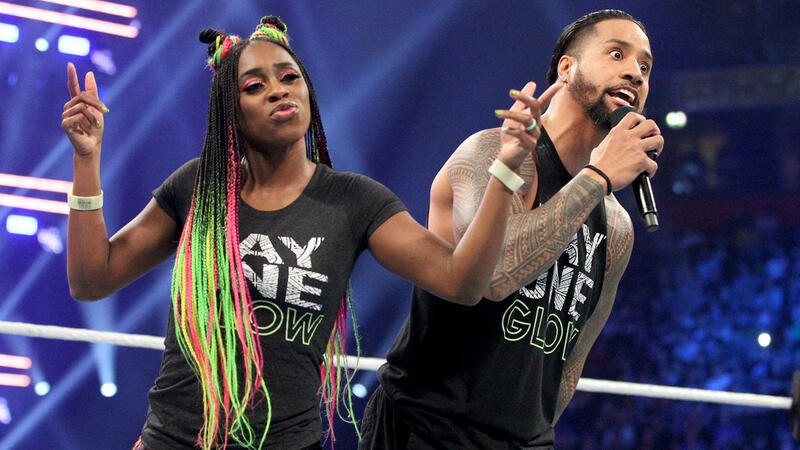 The Fabulous Truth has lyrics especially made for the Mixed Match Challenge. Still, for a group that raps, they were handily beaten by Day One Glow in the rap battle. That was a quick win by Naomi. Carmella was just a WWE Women's Champion a few months back, what happened? In a show of solidarity, the SD teams closed the show with a dance-off on the ramp.